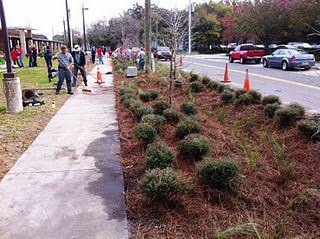 Why swales aren’t funny: Tree-huggers-turned-swale-lovers have installed a bioswale on the parkway in front of the San Marco Library. This “Occupy the Parkway” action was reported in The Resident, which I initially mistook for the band The Residents until I realized I’d forgotten to take my meds. There is nothing amusing about swales. People who spend their Saturday mornings planting and mulching weeds to be watered by gutter water are not to be trusted. Such nefarious types halt economic development by wanting us to go back to living in caves. According to The Resident, the vegetated bioswale will capture “stormwater runoff from roads and rooftops.” A $10,000 grant from Coca Cola paid for it, and its installation was directed by Greenscape. Thirty volunteers from Coke, the St. Johns Riverkeeper, and the zoo worked for free. Supposedly you can read more about it here, but I wouldn’t trust this propaganda. But then, I don’t trust anyone anymore, not since my wife left, taking the dog and the guns with her . . . .
Before Penelope, my ex, drove away, she told me I was like Odysseus, but without the cleverness. Another time she told me that my many life experiences have culminated not in insight, but only in chronic self-delusion. She also said the supposed ‘wisdom’ that should have accompanied my advanced years is actually as extreme, ridiculous, and foolish as were the naïveté and idealism that characterized my youth. She even likened me to a banana, that I went from being green to being brown without ever having been yellow. These were hurtful things . . .
Atop every bioswale is a do-gooder motivated by some perverse desire to work for the so-called ‘social good’ or whatever liberal nonsense. 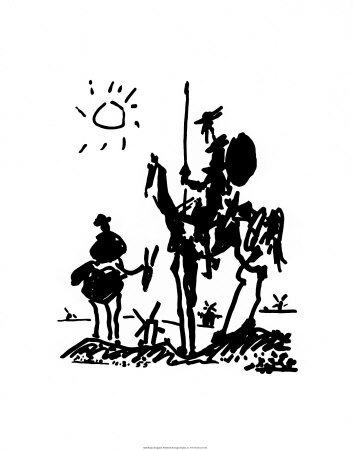 I concede that these crusaders, these idealistic Don Quixotes with Pablo Picasso “Man from La Mancha” posters on their walls, may have good intentions. I think I have made a pretty convincing case. So compelling, in fact, that anyone who disagrees with me must be insane, addled, weak-brained, unreasoning, witless, and stupid. Need more be said? No! I don’t think so . . . Hey! wait . . . Yes! There’s more. Let me repeat: swales are not funny, and must be stopped by what whatever means necessary. Where are my guns . . .
Oh . . . yeah . . . I forgot. She took ’em. . . . Dang! AND SHE TOOK MY PILLS, TOO! Now that I think about it, when was it I last took my meds? . . . Oh, yeah, . . . hmmm . . . now I remember . . . .